A service of thanksgiving was held on the 9th September at All Saints Church, led by the Bishop of Kingston. Some 250 local residents gathered at the event to the celebrate the church's official reopening, following the successful completion of eighteen months of refurbishment work carried out by Dædalus Conservation. The Rector, Jonathan Wilkes thanked all those involved in the project. Particularly the people of Kingston for their fundraising efforts, as well as the Heritage Lottery Fund and Viridor Credits, who provided a £3.7 million grant. "It's not just what they did, but also the way they did it...with courtesy and forbearance. We salute you and thank you for caring as much as we do, and for working carefully and professionally to such good end." 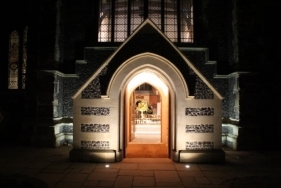 Local residents are thrilled with the new and improved facilities, and sensitive restoration of the church. We are privileged to have been involved, as the works will benefit the local community and generations to come. You can view more photos and information on the project here.